Back in the early 1990s we owned a Solar Electric Installation company in Baja, Mexico. 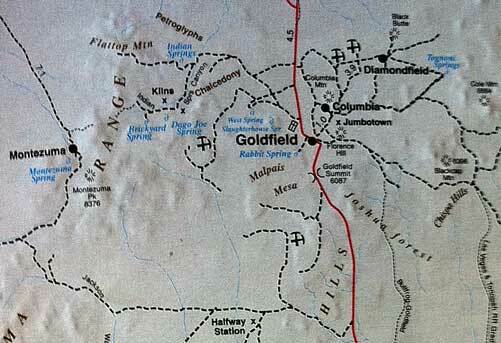 All our jobs were on remote land with no power. To do our work we would have to camp onsite for days and sometimes weeks at a time with no support other than what we brought with us. We didn’t know it at the time but this type of camping with no hook ups (water, electric or sewer) is known as Boondocking. Our guess on where the word Boondocking came from is that you are docking your rig in the Boonies. We really enjoyed the experiences we had in Mexico and the intimacy it provided with nature, quiet and remote communities. We quickly learned how to stretch our water, batteries and gray and black (Sewer) tank capacities. We’ve been out RVing fulltime now for two years getting the lay of the land in the U.S. and seeing a wide range of options for camping. The pull to be closer to nature and not in structured RV parks is getting stronger. Recently we decided to put our systems and habits to the test and try boondocking at California’s largest state park, Anza-Borrego. It is a desert wilderness of over 900 square miles. 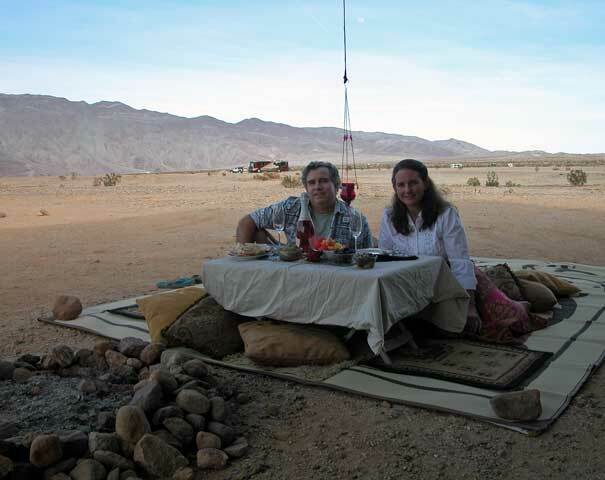 You can camp just about anywhere you want in the vast Colorado Desert of Southern California. We chose to go in February when the temperatures were moderate and comfortable for hiking. 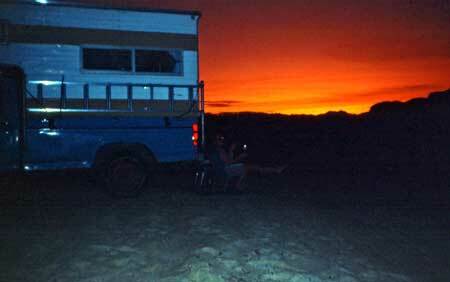 We had a great time and wanted to share some Basics to have in mind should you want to go Boondocking in the future. • BLM (Bureau of Land Management Land) and National Forest Lands are both U.S. Government Federal Lands that are managed with mixed use. They both offer vast opportunities to get out into nature. Many of the areas where boondocking is allowed are designated by GPS Coordinates and require some advanced investigation. If an area is not too forested then Google Satellite can be a valuable resource in your trip planning. What it won’t indicate is the quality of the ground. Getting stuck is a real possibility when boondocking and normal tow services are extremely costly if available at all. We try to advance scout with our car before taking the rig into an unfamiliar wilderness trail. This has paid off many times as we eliminated what appeared to be an appealing destination only to find our jeep wheels spinning in soft sand or thick rutted mud. • Private property can be the best of all. Many remote property owners, farms and ranches, camps and rural business want someone to watch their property, take care of animals or actually work. All sorts of opportunities exist depending on what you want. Often these arrangements prefer caretakers that have their own rig. To find these property opportunities we like Caretaker Gazette. You can also find them in some RV Publications classified ads, bulletin boards at RV Parks and some Real Estate agents are aware of these opportunities in their local communities. We took care of a property in the Sierra Nevada’s of Northern California with 1000 acres of redwoods and stunning nature. You typically need to apply for these in advance, have a resume with references that are reachable and be willing to provide security on the property. If you are willing to watch animals or know anything about maintaining solar systems you will have even more opportunities to choose from. • No matter if you Tent Camping or are in a Million Dollar RV we all have the same basic needs. Carrying enough water, dealing with our sewage and gray water and providing light, cooking methods and warmth. An individual needs about 3-4 gallons of water per day for drinking, cooking, washing and sewer management. We use about 50 gallons in a week for the two of us, but carry 100 gallons. Portable Jerry Jugs are a good tool to bring refillable water to your campsite without moving your rig. It is important to know the size of all your tanks, Fresh Water, Gray Water (Waste Water) and Black Water (Sewage). • What sources of Electricity or Lighting will you have? Campfires, Candle Lanterns, Generators or Solar Power, or a mix of all of these? If you are going with plans to use a generator, do you have an inverter? What are the age and capacity of your batteries? If you are using Solar, do you have a battery monitor to check the In and Out flow of electricity? Know what equipment you have and what your expectations are. • Do you need internet or cell coverage? Since we are still working, this is one of our biggest obstacles to boondocking. Your phone and data providers should have online coverage maps that you can check. They are marginally reliable, but you’ll know right away if an area has any chance for coverage. We use Verizon for Data and ATT for our Cell phone. Verizon seems to have the best coverage hands down nationwide in the U.S.
• Do you want TV? Yes, even your favorite shows can be available in the boonies if you have a satellite dish. Getting clear of trees and natural obstacles to get a clear signal will be necessary and is not always an option. To find the satellite you need to direct your dish towards the correct satellite we use DishPointer iPhone App for locating the Satellite we have to aim for. • Water Conservation is at the top of the list. You need to be able to watch your usage through a visual inspection of your water stores or use a tank monitor gauge. The better you get at managing your water the longer you can enjoy your wild home. Some of the techniques we have utilized are the minimizing the cooking and serving utensils, only flush if you #2, capture the cold water that comes out first in the shower in a large pot and then use it for doing dishes and other cleaning jobs . We have long used Sun Showers as a fun and way to shower out in the elements. I am sure you will have your own tips that we’d love to learn from. Being water aware is just a good practice any way, anywhere. If there is water available from a public tab, it is best to do some sort of water treatment or boiling before drinking. • Manage your electricity and make sure you recharge regularly. We usually run the generator for about 30 minutes when we want to do any heavy draw such as using our blender for smoothies. There are Wet Cell Batteries and Dry Cell Batteries. You need to know how big your house battery bank is and how to monitor their charge (see link below in the Resource list). We try to keep our batteries above 50% charge. They receive a trickle charge, Sun permitting from one solar panel on the roof. Your House Batteries can be a lifeline as a Jump Battery source for your Car or RV starting battery so it pays to give your charging system the attention it deserves. Use of some energy smart devices like newer flat screen TVs, iPods for music and the inexpensive LED solar garden lights can add up in bringing down your daily amperage usage. We use the little garden lights around our RV like a little rope of light. They provide automatic lights to greet us if we are out after dark, and are a deterrent to little creatures that might like to make a home in our undercarriage. • Conserve your propane. If you carry propane it can be a more efficient method of running your refrigerator, your water heater, to do your cooking and provide you heat. If your systems have the duel fuel option then switching over to Propane can extend your stay and minimize your reliance on producing electricity with a generator or solar panels. • Trash can become a problem. A little advanced planning can minimize it. A lot of places do not allow camp fires due to the risk of forest fires so don’t count on burning your trash. Before you go, try and de-package all cardboard and plastic package containers to minimize future trash. Shift storing of these products into smaller or reusable containers. You will be responsible for proper disposal of your trash so the less you create the less of a hassle it will become. CAUTION: Don’t leave your trash out. Unless you want the uninvited Bear, Raccoon or Coyote keep your trash securely stored in your vehicles. • Waste (Sewage) Management can be extended by watching the amount of water you use when flushing. Another option is to use of a portable waste tank that can be a transitional method for emptying your tanks and taking the portable waste tank to a dump station without pulling up stakes at your campsite. • Bundle Up. It may seem like common sense but in our modern society of living in climate control environments it’s easy to think about turning on the air or heat instead of changing our clothes. Dress in layers and you’ll be able to shift easily as the day unfolds. • Awning Control. It’s tempting to leave your awning out, but it can be problematic with sudden winds. If you do want to leave it out all the time, be sure to anchor it really well. We use buckets with water or sand in them to tether the awnings to. • Fire Safety is Life Safety. Smokey the Bear had it right, “Only YOU can prevent forest fires.” Use a metal fire ring with an ember screen. • Boondocking comes with a slightly higher risk. Most of the time you are going to just have a great time but you are typically outside the range for assistance from anyone, including law enforcement. If you can, boondock with someone else. Don’t let strangers into your rig, and don’t answer the door to strangers. Be prepared to pull up stakes fast if something goes sour. A dog is a great asset when boondocking if you have one. If you hear noise outside at night, flip on exterior lights but don’t go out. Use your common sense and think of security prior to do it. • Be aware of your surroundings. That wide, flat, beautiful dry creek bed could turn into a raging river with a little rain, or you could park yourself at a dead end box canyon and have no way out in the case of fire. • It may sound silly but Trust your Gut and the little Hairs on the back of your neck. Millions of years of evolution gave us an advanced warning system; most of us just forgot we had one. • When hiking we carry a stun gun and a cell phone and a hiking GPS. We carry snake bite kit in our packs and plenty of water. The elements can be just as big a threat as man, so take your personal safety personally and plan ahead. COSTS OF BOONDOCKING: We are burning Fuel in the generator, Propane for our appliances, hauling our waste to a dump station or sweat equity on keeping the campsite nice when we leave. Despite the illusion that we think we are free camping, it is not completely free. PRICELESS: Being serenaded to sleep in the secure comfort of our rolling home by a nearby family of coyotes. Boondocking does not have to be all roughing it. 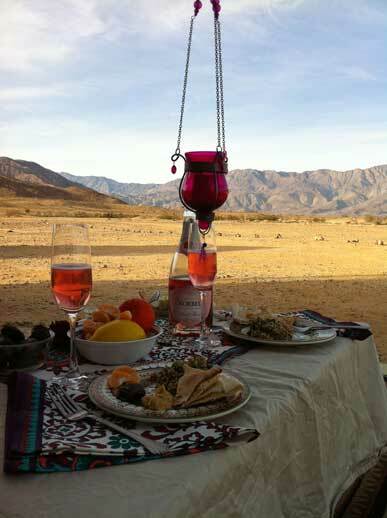 Here is our Casablanca Themed Valentine’s Day picnic while boondocking at Anza-Borrego. Garmin eTrex 20 Worldwide Handheld GPS Navigator(click on image) – Love this GPS, it’s tiny, has a lot of great features and we’ve come to rely on it. SunShower 5.0 with 4-5 showers (Capacity- 5 gallons)(click on image) – Shower under the stars, under trees, on the back of boats or in your own backyard. We’ve lived with our SunShowers for decades all over the world. Into the Wild movie(click on image)– A true story movie with a semi-cult following about a young man that does extreme boondocking in the wilds of Alaska. This can be a difficult movie to watch. Boondocking.org– a Database for GPS Coordinates and Free campsites. !!!!!! We would love your suggestions for Camping Information. !!!!!! So glad you liked our Casablanca Valentine’s themed picnic. It was fun. Hope you and your wonderful mate at least had a virtual celebration.